INT code is compact and can be read by a human. To view it in the studio, press Ctrl+Shift+V. Where can macros be defined? Either in the code or in standalone INC files containing only macros. The necessary files are included into classes at the very beginning of class definitions using the Include MacroFileName command – this is the main and preferred method of including macros into classes. Macros included this way can be used in any part of a class. You can use the #Include MacroFileName command to include an INC file with macros into MAC routines or the code of particular class methods. Note, that method generators require #Include inside their own body if you want to use macros at compile time or use of IncludeGenerator keyword in a class. #define HW Write "Hello, World!" What is going on in these macros? If you are using lists and arrays inherited from the %Collection.AbstractIterator class, you can write a similar iterator for it. Write "You are using the latest released version of Caché"
Write "You are using the latest beta version of Caché"
Write "Please consider an upgrade"
This capability may come in handy, for example, in situations where you want to ensure compatibility of the client application with older and newer versions, where new Caché features may be used. 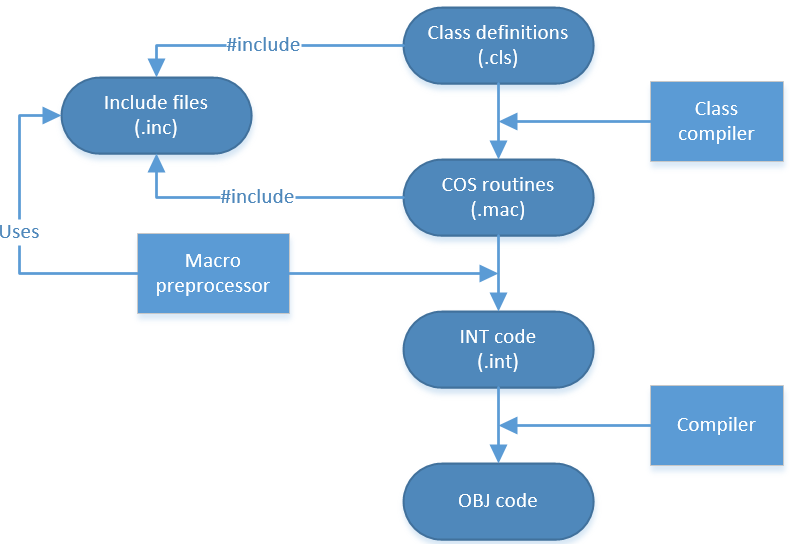 Preprocessor directives #IfDef, #IfNDef serve the same purpose by verifying the existence or absence of a macro, respectively. Macros can make your code more readable by simplifying frequently used constructions and help you implement some of your application's business logic on the compilation stage, thus reducing the load at runtime. In my next article, I will tell you about a more practical example of using macros in an application – a logging system. On the whole a nice job. Three points however. Be careful in saying the .CLS, .MAC code can be deleted. If they ever wish to change their code they will need the classes and possibly the .MAC code. There continues to be a lot of confusion around writing .INT code as a main source. The VA does it all the time. The dangers of this should be pointed out. The differences between .MAC (Macro) Routines and Macros should be explained. Be careful when using ##Unique. The problems with scope of generated "unique" variable can introduce weird bugs (in some cases it is not as unique as you would expect; WRC problems 879820 and 879901). for that method. However, the variable itself is globally scoped. Also ##Unique directives cannot be used in nested macros (macro calling another macro; WRC 879901).